I've got a late 2008 macbook pro with a 802.11n airport card. I also have a Netgear wndr3400v2 router. If I use speedtest.net and an ethernet cable I can get 59mbps down but if I switch to wifi I only hit around 33mbps. Clearly this indicates a bottleneck from the wifi so I used LAN speedtest to test my network speed and got a dismal 7mbps. Now for the trouble shooting: It's a dual radio router so I have everything that can't run on the 5ghz network on it's own 2.4ghz network. So with that out of the way I downloaded a network analyzer on my phone and looked to see if there was interference and I should switch channels. There are 6 other networks visible to my computer but using the network analyzer shows that they are all very low power from my house and none of them are running on the 5ghz band. Since there are no other 5ghz networks there is no wifi interference and changing channels would do no good. Not only that but the signal is good with a signal strength between -50 and -60. Now what? I'd like to take advantage of the internet speed I'm paying for but running a cable isn't something I want to do. Not sure how else to get a faster wifi network when there is no interference and the signal is strong. Turn off all devices using either (dual band) network bar the laptop and test it then. Switch off the lower band service - if only temporarily for testing purposes. Use an alternative 802.11n computer - be it another Mac or one running Windows. Swap out the router - not an easy option but essential to prove it's not that. Try the router at another place - or two - even if the hard-wired speed there is quite different to yours. P.S. Never rely on an iOS device for speed testing as they - actually the apps themselves - usually show a much lower speed than a computer. I've got the last generation macbook they made and my late 2008 macbook pro. Both are 802.11n and connected to the 5ghz network: Both computers show the same results. I'm not relying on an iOS device for speeds. I've got a Nexus4 and I'm using it to show me the other networks and their signal strengths but not to test actual speed. The router is only a few months old but it is certainly possible that it's the issue. If it were the issue it would be a matter of design vs malfunction and I'd have to buy a more expensive router. I'm obviously hoping that's not the issue but I also don't have a way to test that. I don't have a different router and I'm not going to be able to tell the wife that we have to buy another brand new router to get the extra 20mbps. I also don't know anyone else with an internet connection fast enough to test that bottle neck. I need someone with a connection faster than about 30mbps. I guess didn't say it in the original question but I definitely suspect the router is for some reason not capable of faster speeds and I'm just trying to see if there is something I might be missing aside from that. Having worked for an ISP addressing no end of different problems - including Wi-Fi - I can certainly say that the router might (just might) be the issue. It's rare to find any router that will have Wi-Fi close to Ethernet speeds and such a difference is not that uncommon - the main cause being interference - that seemingly not being the problem you have. One test you could try it to transfer a file from one Mac to the other over the network at home and again in one or two other places - there not being connected to an ISP - to see if the speed differs. That, at least, might show whether it's interference. I've come across two Windows computers running at quite different speeds on the same Wi-Fi network - that getting resolved somehow - quite how I forget but I suspect it was a driver issue. It's always worth trying a Windows computer or two - if you can borrow such - if only to see if it's not a driver issue. (That could be on the Macs or the router itself - i.e. the firmware in the latter case.) Failing that it's worth trying the Netgear web site. the Mac is old. it will only go as fast as it goes. changing the router won't help. in the utilities folder there is a tool called Network Utility. it will tell you the connection speed to your wireless router. here is the mine connected to a Wireless G access point. and here it is connected to a Wireless N network. 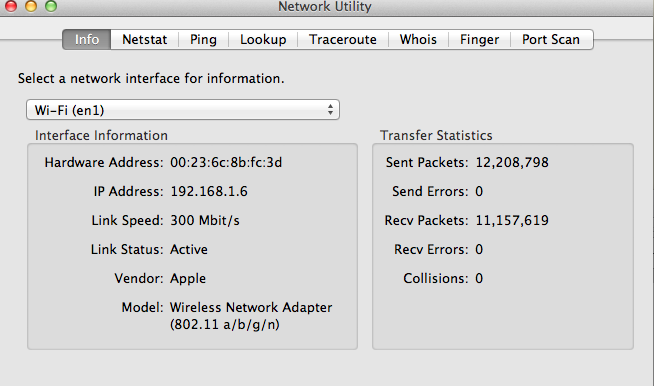 this is with a 2007 era MacBook Pro connecting to a 4th generation Airport Extreme which supports multiband. That's the same info that I posted, it's just easier to get to it via an option click on the network icon. For the sake of keeping things the same though, here is that screen. As you can see, it's showing a 300mbit/s connection. The only way to get that is a channel bonded 40mhz connection on a 5ghz channel. In other words, there is no issue with the technology of the client and seemingly no issue with the technology of the router. However just because you are on a connection capable of 300mbit/s does not mean you actually get that speed. In order to test your network speed you need to transfer data between two computer on the network and time it. An excellent way to do that is using http://www.totusoft.com/lanspeed1.html. When I do that test I'm only seeing a LAN speed of 7mbps which is, obviously, ridiculously low. Remember though I'm not really trying to solve an issue of network file transfer speed. I don't much care about that. The issue is that my internet connection is being limited by my wifi speed and I can't see any obvious reason why. At this point I've got some excellent suggestions: take the router to another location and test the network speed there to rule out some unknown interference or swap the router for another one and see if that changes anything. Unfortunately as good as those tests would be they both seem like a bit of a dead end. If there is interference then I can't do anything about it. If instead it's the router well this one is pretty much brand new and I'd have to convince the wife that we need to buy another router, that is likely a lot more expensive, to get something she doesn't much care about. I was hoping there was going to be some obvious answer, change channels or something, but it doesn't seem like that is going to happen. distance and the material between the router and the computer seems to be the biggest issue in my experience.